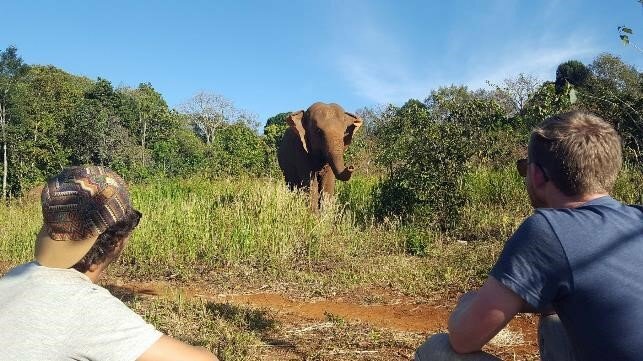 This vast eco-tourism site surrounded by protected forest and local farms serves as the Elephant Sanctuary that currently looks after 10 elephants. This sanctuary has been developed in close partnership with the local indigenous Bunong community of Pu Trom. Volunteers will be staying at the project site with their work split equally between visits with elephants and volunteer activities. Volunteer activities can include the reforestation projects, planting seeds and looking after the nursery, farming or construction work. No riding, feeding or swimming with elephants are taking place, and volunteers will mainly be watching and learning about the elephants from a distance. Volunteers should be aged 18 years or over, be moderate to very physically fit (capable of walking several kilometres per day in varied/hard terrain), and speak English. Volunteers should have a strong motivation to help and contribute to the community and animal welfare, and be able to cope with living and working in hot (and sometimes wet) conditions.